The Mishneh Torah (משנה תורה: Hebrew for "Repetition of the Torah"), subtitled Yad ha-Chazaka (יד החזקה: "The Strong Hand"), is a code of Jewish law by one of the most important Jewish authorities of the Middle Ages, Rabbi Moshe ben Maimon, better known as Maimonides (1135–1204). The Mishneh Torah was compiled between 1170 and 1180, while he was living in Egypt, and is regarded as Maimonides' magnum opus. The work consists of fourteen books. To this day it is the only post-Talmudic work that details all of Jewish observance, including those laws which are only applicable when the Holy Temple is in place. The Mishneh Torah stands out as one of the greatest Jewish works of the Middle Ages, and arguably the most important Jewish work during this period. Maimonides ambitiously sought to summarize the immense corpus of divine laws found both within the written and Oral Torah, which encompassed the spiritual, juridical, and exegetical inquiry generated by the worldwide rabbinical community in the centuries following the destruction of the Second Temple (70 C.E.). Consequently, the Mishneh Torah includes an immense amount of material that spans the entire history of Judaism up until that point. Such a daunting task has made a deep impression of Jewish scholarship. Today, Maimonides is remembered as the most famous Jewish rabbi of the Middle Ages, whose work is still admired and read by many. The work is written in a clear Hebrew style of the Mishnah. Maimonides was reluctant to write in Talmudic Aramaic, since it was known only to those who were specially interested in it (Preface to the "Mishneh Torah"). His previous works had been written in Arabic. The intention was to provide a complete statement of the Oral Law, so that a person who mastered first the written Torah and then the Mishneh Torah would be in no need of any other book. For this reason, it never cites sources or arguments, and confines itself to stating the final decision on the law to be followed in each situation. There is no discussion of Talmudic interpretation or methodology, and the sequence of chapters follows the factual subject matter of the laws rather than the intellectual principle involved. Over time many textual errors and distortions have appeared in the various editions of Maimonides' Mishneh Torah. There are various reasons for this phenomenon. Some are due to errors by the copying of manuscripts (before the age of printing) or mistakes by the typesetters of later published editions. Others are due to conscious attempts to "correct" the text, and still others are due to Christian censorship (in countries under Christian control). Moreover, Maimonides, himself, frequently edited the text of his own autographed copy, such that manuscripts copied from his own book did not preserve his later corrections. Consequently, the received version may not be the text that Maimonides intended the people to read. Rabbi Yosef Qafih's edition—In this edition the version is based mainly on Yemenite manuscripts, and includes an extensive commentary by Rabbi Qafih that surveys the discussions of the classical commentaries on Mishneh Torah and includes verbatim citation of previous commentaries in their entirety. "The Exact Mishneh Torah" edition by Rabbi Yitzchak Shelat—This edition has no commentary. It essentially compares the printed versions to the fixed version. 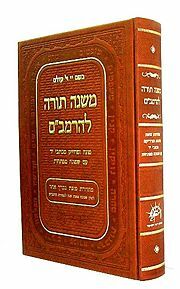 An one-volume edition (1000 pages) reflecting all the editions based on reliable manuscripts, accompanied by surrounding indexes but with no commentary, has been published by the "Or Vishua" Yeshiva. The text in this edition was checked again, based mainly on Rabbi Yosef Qafih's edition. It gives variant readings from the other leading editions only in cases where the changes are meaningful. Maimonides sought brevity and clarity in his Mishneh Torah and, consequently, he refrained from detailing his sources. He felt it sufficient to name his sources in the preface. He drew upon the Torah and the rest of Tanakh, both Talmuds, sifre and sifra, and the Midrashic literature. It appears that on occasion he preferred rulings in certain Midrash collections to rulings in the Talmud, which would have been a rare opinion at the time. Later sources include the responsa (teshuvot) of the Geonim. The maxims and decisions of the Geonim are frequently presented with the introductory phrase "The Geonim have decided" or "There is a regulation of the Geonim," while the opinions of Isaac Alfasi and Alfasi's pupil Joseph ibn Migash are prefaced by the words "my teachers have decided" (although there is no direct source confirming ibn Migash as Maimonides' teacher). The Mishneh Torah was strongly opposed almost as soon as it appeared. Major objections were the absence of sources and the fact that the work appeared to be intended to supersede study of the Talmud. Some criticisms appear to have been less rational in nature. The most sincere but influential opponent, whose comments are printed parallel to virtually all editions of the Mishneh Torah, was Rabbi Abraham ben David of Posquières of France, writing in the 1100s. Many critics were especially bitter against the new methods that Maimonides had employed, and the peculiarities which he had regarded as merits in his work failed to please his opponents because they were innovations. Thus, they reproached him because he wrote in Hebrew instead of in the customary Talmudic idiom, because he departed from the Talmudic order and introduced a division and arrangement of his own, and because he dared to decide according to the Tosefta and the Jerusalem Talmud as against the Babylonian Talmud. Especially sharp was the blame heaped upon Maimonides because he neglected to cite his sources; this was considered an evidence of his superciliousness, since it made it difficult, if not absolutely impossible, for scholars to verify his statements, and compelled them to follow his decisions absolutely. Yet despite all this, Maimonides remained certain that in the future the Mishneh Torah would find great influence and acceptance. Abraham ben David (c. 1125-1198), known as the Raavad, was forced to acknowledge that the work of Maimonides was a magnificent contribution (note on Kilayim 6:2), nor did he hesitate to praise him and approve his views in many passages, citing and commenting upon the sources. Later works (for example, Yosef Karo's "Kesef Mishné") set out to find sources for Maimonides' decisions, and to resolve any disputes between him and the Raavad. Special mention should be made of Yonah of Gerona, a nephew of Nachmanides (The "Ramban"), who was initially a member of the vocal opponents of the "Yad." Yonah of Gerona was involved in the burning of a number of copies of the work in the 1240s. Regret followed, when he saw the Talmud being burnt in Paris in 1244, which he interpreted as a sign from Heaven that he had been mistaken. He set out to the Land of Israel, composing a classic work on penitence (titled Shaarei Teshuva, "The Gates of Repentance") during his soul-searching. 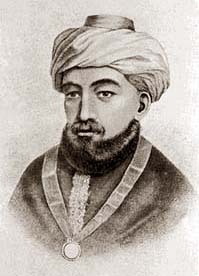 Notwithstanding the sharp attacks upon it, the work of Maimonides soon won general recognition as an authority of the first importance for ritual decisions. According to several authorities ("Yad Mal'akhi" rule 26, p. 186), a decision may not be rendered in opposition to a view of Maimonides, even though the latter apparently militated against the sense of a Talmudic passage, for in such cases the presumption was that the words of the Talmud were incorrectly interpreted. Likewise it was said, "One must follow Maimonides even when the latter opposed his teachers, since he surely knew their views, and if he decided against them he must have disapproved their interpretation" (Ibid, rule 27). Even when later authorities, like Asher ben Jehiel (the Rosh), decided against Maimonides, it became a rule of the Oriental Jews to follow the latter, although the European Jews, especially the Ashkenazim, preferred the opinions of the Rosh in such cases. Maimonides hoped that his work (and his alone) would be accepted has been only half fulfilled. His "Mishneh Torah" is indeed still very popular, but there has been no cessation in the study of other works. Ironically, while Maimonides refrained from citing sources out of concern for brevity (or perhaps because he designed his work to be used without studying the Talmud or other sources first), the result has often been the opposite of what he intended. Various commentaries have been written that seek to supply the lacking source documentation, and indeed today the Mishneh Torah is sometimes used as a sort of an index to aid in locating Talmudic passages. In cases where Maimonides' sources or interpretation thereof is questionable, the lack of clarity has at times led to lengthy analyses and debates—quite the opposite of the brevity he sought to attain. Mishneh Torah itself has been the subject of a number of commentaries: Kesef Mishné by Yosef Karo, Mishné la-Melech, Lechem Mishné, Radvaz, and Hagahot Maimoni (which details Ashkenazi customs). Most commentators aim to resolve criticisms of the Raavad, and to trace Maimonides' sources to the text of the Talmud, Midrash, and Geonim. Later codes of Jewish law (for example, Arba'ah Turim by Rabbi Jacob ben Asher and Shulchan Aruch by Rabbi Yosef Karo), draw heavily on Maimonides' work, and in both whole sections are often quoted verbatim. Prominent recent authorities who have written commentaries on the work include Rabbis Meir Simcha of Dvinsk (Ohr Somayach), Chaim Soloveitchik (Chiddushei Rabbeinu Chaim), Yitzchok Isaac Krasilschikov (Tevunah), Isser Zalman Meltzer (Even HaEzel), and, more recently, Menachem Mendel Schneerson (Hadran al HaRambam), Elazar Shach (Avi Ezri), and Rabbi Yosef Kapach. Today, thousands of Orthodox Jews, particularly Chabad Hasidim, participate in one of the annual study cycles of Mishneh Torah (1 or 3 chapters a day). Mishneh Torah is often one of the first post-Talmudic sources consulted when investigating a question of Jewish law. Likewise, many scholarly speeches (for example, the traditional Rabbi's speech on the Shabbat preceding Pesach and Yom Kippur) often revolve around a difficulty between two passages in Maimonides' work. An increasing number of Yemenite Jews, as well as various other individuals, are being attracted to the Mishneh Torah as their choice code of Jewish law by which to live. The reasons for this attraction may range from a personal desire to return to the ways of their ancestors, as is possibly the case with many Yemenite Jews, to a desire for keeping Torah in a way that, from their perspective, is more in line with historical Talmudic Judaism, more rational, and less influenced by Kabbalistic innovations. Birnbaum, Philip. 1944. Maimonides' Mishneh Torah: Yad Hazakah. Hebrew Pub. Co. ISBN 0-88482-437-3. Buijs, J. 1988. Maimonides: A Collection of Critical Essays. Notre Dame, IN: Notre Dame University Press. ISBN 0268013675. Davidson, Herbert. 2005. Moses Maimonides. Oxford: Oxford University Press. ISBN 019517321X. Fox, Marvin. 1990. Interpreting Maimonides. Chicago: University of Chicago Press. ISBN 0226259420. Hyamson, M. (trans.). 1974. Maimonides: The Book of Knowledge. Jerusalem: Feldheim. ISBN 088125035X. Seeskin, Kenneth. 2005. Maimonides on the Origin of the World. New York: Cambridge University Press. ISBN 0521697522. Seeskin, Kenneth (ed.). 2005. The Cambridge Companion to Maimonides. New York: Cambridge University Press. ISBN 0521819741. Strauss, Leo. 1952. "The Literary Character of the Guide to the Perplexed," in Persecution and the Art of Writing. Glencoe, Illinois: The Free Press. ISBN 0226777111. Twersky, I. (ed.). 1972. A Maimonides Reader. West Orange, NJ: Behrman House. ISBN 0874412064. Weis, R., and C. Butterworth (eds.). 1975. The Ethical Writings of Maimonides. New York: Butterworth. ISBN 0486245225. This page was last modified on 1 August 2008, at 15:26.